Let your style sizzle with these signature shades from SM Accessories! Hurry and grab a pair or two of these branded frames that are up to 70% off (on selected branches) until May 31, 2013! Hey Coffeeholics! It's been a while. Yes I know Summer is nearly over but well you know that here in the Philippines, we have only two seasons. Rainy and sunny season. Definitely wearing shades is a must! So don't miss out on this amazing up to 70% DISCOUNT on these branded accessories. 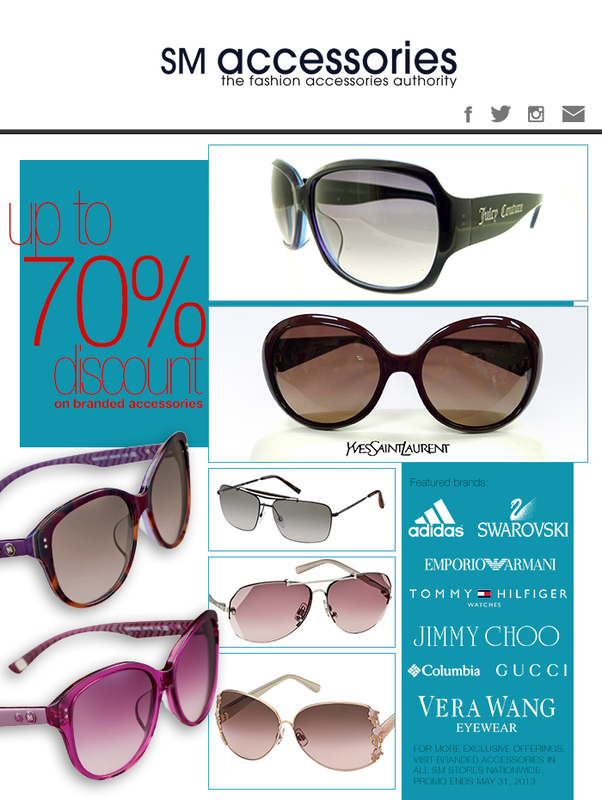 Some featured brands are Addidas, Swarovski, Armani, Tommy Hilfiger, Jimmy Choo, Columbia, Gucci, and Vera Wang Eyewear. For more exclusive offerings, visit branded accessories in all SM Stores Nationwide. This Promo ends May 31, 2013. So if you've been longing for those lovely pair of sunnies for some time already, well now is the perfect time to shop! Happy Shopping!